ICPA’s annual conference is one of the largest events in the prisons and correctional field. With over 150 speakers, we provide a rich and diverse programme which covers a wide variety of topics addressing challenges and highlighting best practices. In 2018 ICPA will be back home, in Canada, to celebrate its 20th Anniversary, and to deliver an exclusive an unforgettable event with the support of our hosts - the Correctional Service of Canada! Join us and more than 500 of your colleagues from across the globe for a sharing and learning experience! Hear about best practices, innovations, new approaches and the latest technologies.Take home new perspectives, ideas and a wealth of global insights and practical applications. Our attendees comprise Heads of Service, CEOs, senior management, correctional practitioners, industry leaders and many experts from the corrections community. If you are a professional working in prisons and corrections or related industries and organisations, then the ICPA conference is for you! To register for the conference, click on the 'New Registration' button located on the top right and complete the registration form. Registering is quick and easy - pay online securely by credit card or print your invoice for payment by cheque, bank or wire transfer. Please note that we do not accept AMEX. An alternative hotel has been arranged. Hôtel Bonaventure Montréal is a short 3 minute walk from the conference venue and can be accessed via the Metro tunnel located in the Lobby (level GH) of the conference venue. ICPA is not responsible for your accommodation arrangements. Please ensure that you direct any booking queries to the hotel. 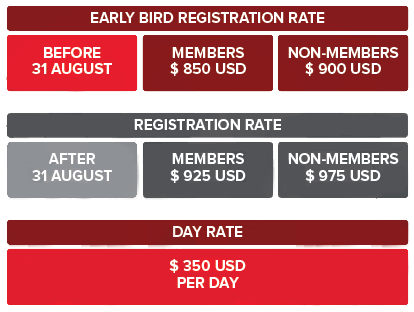 31 August - Early-Bird Registration Ends! Delegates who select the option Full Registration (Basic or no individual membership) will be provided a Complimentary Code for one year of Full Membership with ICPA. Your membership will be valid from the 1st July 2018 for a period of 12 months. Complimentary Codes are only given upon successful payment of the registration fee.